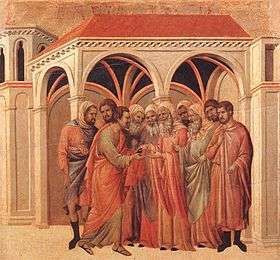 Judas making a bargain with the priests, depicted by Duccio, early 14th century. 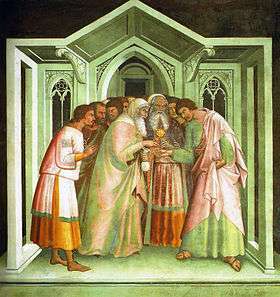 Bargain of Judas, fresco by Lippo Memmi, 14th century. The Bargain of Judas is a biblical episode related to the life of Jesus that appears in all three Synoptic Gospels, Matthew 26:14–16, Mark 14:10–11 and Luke 22:1–6. It relates how Judas Iscariot made a bargain with the chief Jewish priests to betray Jesus. Then one of the Twelve—the one called Judas Iscariot—went to the chief priests and asked, "What are you willing to give me if I hand him over to you?" So they counted out for him thirty silver coins. From then on Judas watched for an opportunity to hand him over. In the New Testament Jesus is later betrayed in the Kiss of Judas incident. The Bargain of Judas is considered one of the seven key episodes that relate to the events of the week of the Crucifixion of Jesus. Wikimedia Commons has media related to Pact of Judas. This article is issued from Wikipedia - version of the 11/24/2013. The text is available under the Creative Commons Attribution/Share Alike but additional terms may apply for the media files.